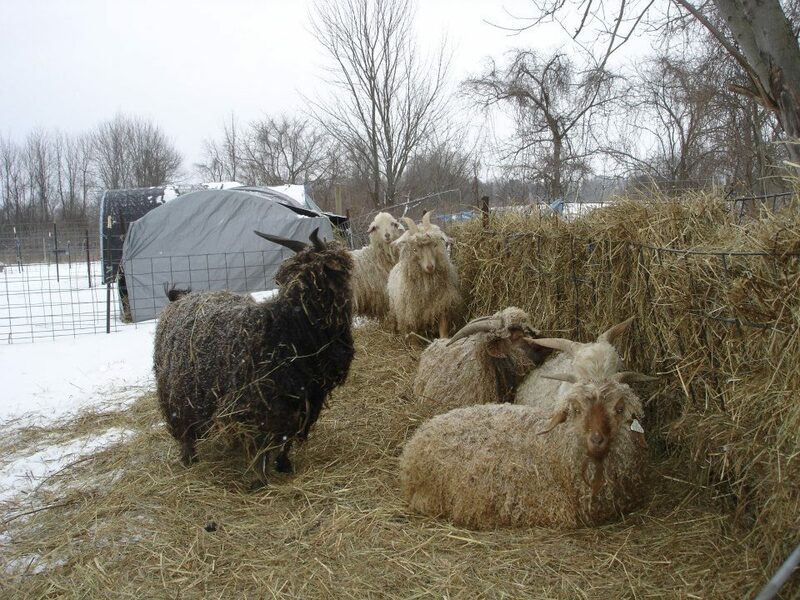 Although our farm began with just three angora goats (Winkin, Blinkin, and Nod), we now have several different kinds of fiber animals here on the farm. 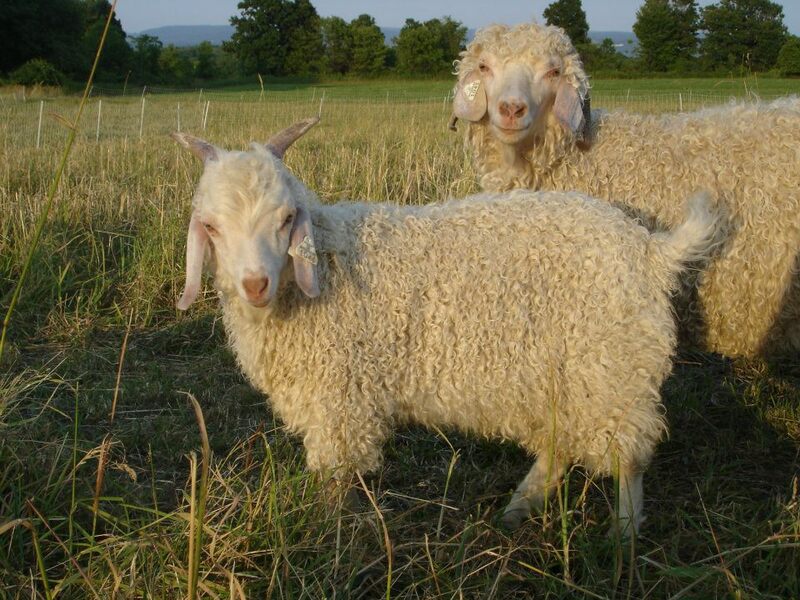 Our pride and joy – these goats have the long, luscious mohair curls that we use in almost all of our products. 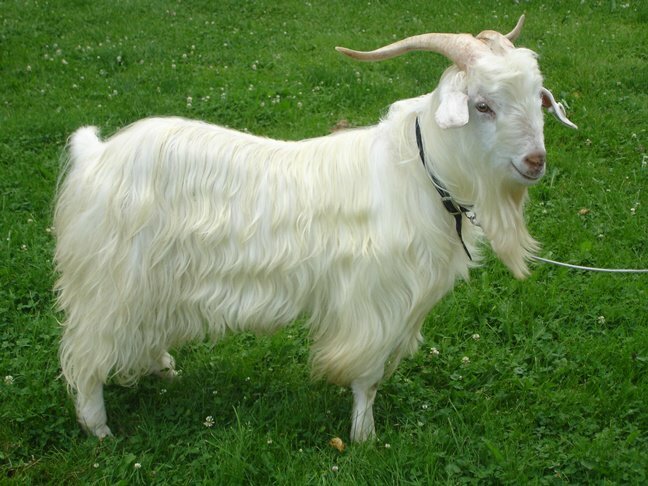 Native to Turkey, these goats are still relatively rare in the United States, and their fiber is considered exotic. Mohair should not be confused with angora wool, which actually comes from rabbits. It is a soft, strong fiber, which takes dye beautifully and is renowned for its warmth and durability. Like sheep, angora goats are sheared of their fleeces twice a year. Although angora goats are horned and may look fierce, they are gentle and playful. Cashmere goats are not an official breed – it may surprise you to learn that almost all goats actually produce cashmere, which is the soft undercoat that they grow to keep themselves warm. Cashmere goats are selected for the fineness of that hair. These goats are native to the Himalayan mountains, and the Kashmir region of Pakistan. Unlike angora goats, they are combed, not sheared. We can harvest pounds upon pounds of angora from a single goat, but usually only ounces from one cashmere! It is still considered among the finest of all exotic fibers. Our cashmere goats are hardier than the angoras, and come with a little extra personality – which makes them a lot of fun! We also raise alpacas, a smaller relative of the llama, native to Peru. Alpaca fleece is one of the softest fibers in the world, often used in infant clothes and blankets. Like mohair, alpaca is exceptionally warm, and, like cashmere, considered one of the most luxurious natural fibers. Alpacas are sheared, and they shrink several inches in width once their fleece is off! We recently increased our alpaca herd, and now have nine sweet fellas. They are skittish, but extremely curious – we often hear them talking among themselves, and they love to keep an eye on playful baby goats. 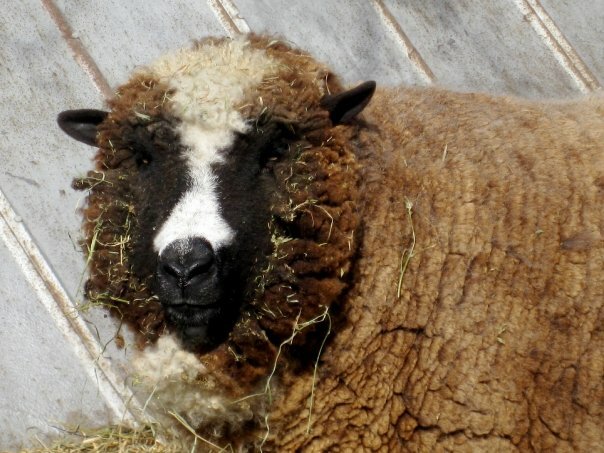 We have also had sheep on our farm, although we currently only have one black merino. She is a tough cookie who likes to run with the boys, and her wool is sometimes blended with our mohair and alpaca to help the finer fibers keep their shape. In addition to cashmere and angora goats, we also raise some “cashgoras”. Often the result of an illicit rendezvous, these goats can have fleeces that are soft but also very durable. They tend to be bigger and hardier like our cashmere goats. This year, we also added two Boer goats to our herd, and bred them with our cashmere buck. Our goal is to produce some bigger animals who will yield more fiber. We have kids, yearlings, and other animals for sale throughout the year. With award-winning animals and beautiful fleeces throughout our flock, we have become a sought-after breeder in the region. Check out our animals for sale page for more information. Want to see the animals for yourself? Check out our videos! Thanks! We’re expecting baby goats in April this year. We’re hoping to add a new barn and some fiber processing capability so stay tuned!